So at the end of January I needed to set myself a target. I hadn’t run for 3 months due to a stress fracture in my foot, but I needed to start building up the miles again. I was at the podiatrist getting some tips on how not to break my foot again & I asked him how I should start running again & what I could aim for. He asked what I was thinking about & I mentioned the 3 peaks at the end of April, and his reply was “of course you should do it”. Well I didn’t need telling twice, so on the entry day I put my name done, and that was it, I was committed. My first “run” was supporting the Buckley blues at the North Wales Cross Country Champs, which was great fun nipping across the course to cheer folks along; and importantly I didn’t suffer a reaction. But building your mileage by 10% each week, and the long run by 1-2 miles per week, meant that I didn’t have much room in the schedule to be ready for a 24 miler at the end of April. But at least I was started. 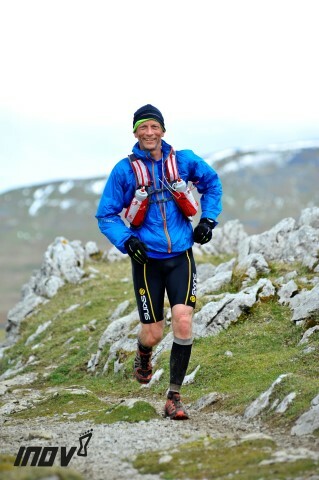 Most of the training was done off-road, which meant that I didn’t risk a Borders League until our home race in Mold. Even then, as Hazel noticed, I ran the race in fell shoes for a bit of extra protection (& they were good on the hill up to Nercwys). 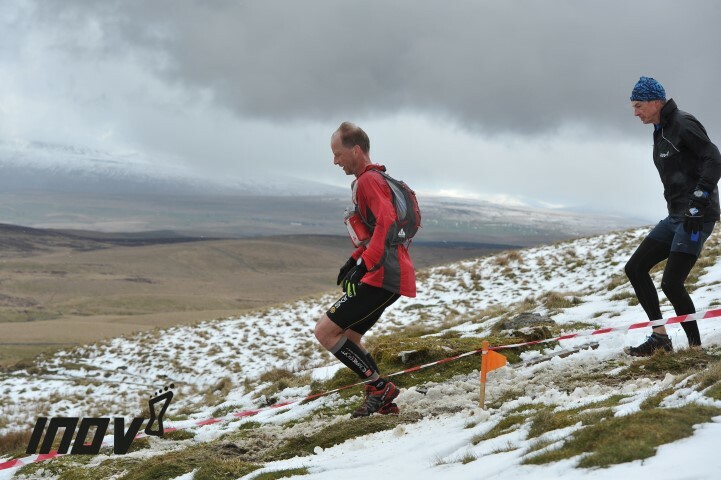 Race day soon came, and all the pics on the Facebook & web pages had been of snow on the hills, and so it proved. As we got ready for the start the weather was really ‘warm’ (it’s all relative) & runners were discarding layers to minimise weight. Luckily, just before the start, a cloud come over & the temperature plummeted; the tops were put back on, and stayed there for the rest of the day !. There were a 1000 people entered, although only 800 started, so the beginning was like a mini-London marathon, with starting ‘pens’ according to your guestimated finishing times. The elite were at the front & disappeared off in a cloud of dust (well mud, but dust sounds better). The rest of us set off at a more leisurely pace. But we couldn’t be too leisurely as there were cut-offs to be met ! 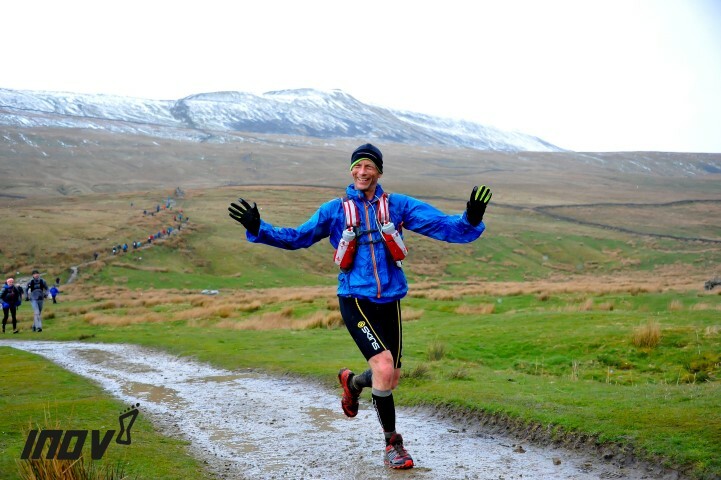 So my usual method of sauntering up the hills had to be discarded for a fear-fueled attack up the first hill, Pen-y-Ghent. The leaders came back down the same track that we were going up so we got a first hand view of how fast those guys really are. Scary fast ! I made the top in 46 minutes, right on schedule for the first cut-off, so no chance to ease off at all. 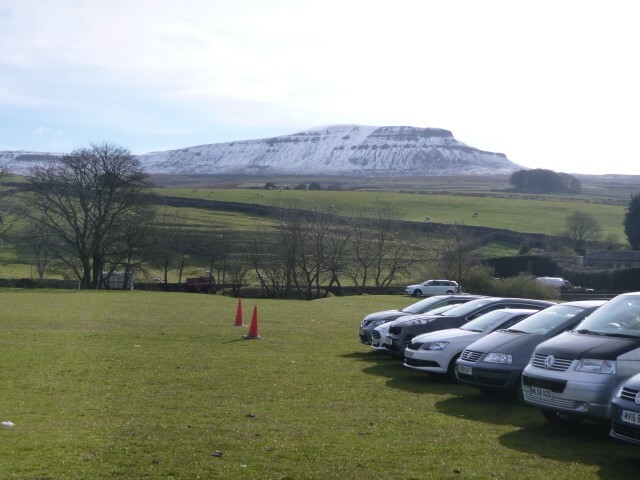 Time to test out the downhill legs for the first time, and then onto the first ‘runnable’ section over to Whernside. Funnily enough, this turned out to be the hardest section of the day – I’d be doing lots of hill work because of the 3 main peaks, but due to lack of time since I’d started training again, I hadn’t done much basic running, and it showed. Despite this the famous Ribblehead viaduct was reached in 1hr 55mins (a whole 15 minutes under the cut-off), where we could pick up our first drink – flat coke, the drink of the ultra gods ! The plan went slightly awry here as my wife had driven up to see me at the checkpoint, and somehow we missed each other – better make sure we meet at the next one, otherwise that was a very long wasted drive. So, off to Whernside. We’d been warned that this was ‘straight up’ the front, and after a 5 minute wait to get over a stile, which allowed a bit of recovery time, so it proved. But there’s something about expecting it to be really hard, that made it seem not-so-bad, and we soon topped out. No hanging about though as there was another cut-off to meet, so we legged off down. Well, that somewhat exaggerates the speed as we were embroiled in a rather large group of 3 peaks walkers, all of us trying to get down a rather slippery set of snow/water covered rocks, which was interesting to say the least. Down to Hill End in 3hr 20mins (10 minutes before the cut off, but this was the last one so happy days). Liz was there this time, so time for good chat to make up for missing each other at the last one, and another bottle of the drink of the gods. Caffeined up there was no stopping me now. Off to Ingleborough & the last peak of the day. Again it seemed to pass pretty quickly – all those trips up & down Moel Famau & Ffenlli had done their stuff – and it was just a question of the last ‘runnable’ section down to the finish. I remember reading in Simon R’s blog that this bit was tough on the legs & I can fully sympathise. On the profile it looks like a simple downhill, but it’s one of those tracks where you have to watch your step all the way so you never get up full steam. Soon enough though the finish marquee came into view & the handbrake came off allowing a flat out jog to the finish. 554th out of 700 finishers, in just under 5 hours, let me know my place in the fell running community (& that was without Jez & Simon running !). All-in-all, as Jez would say, a ‘great race’ & a real classic. One for your bucket list.